Local oil and gas producer Ravenwood Energy donates $5000 to the Thorsby Fire Department towards the new tanker truck. Thorsby Fire Chief Norm Osness (Left) received the cheque from Ravenwood Energy employee and Thorsby Firefighter Devin George (Right) during the May 28, 2013, Regular Village Council meeting. 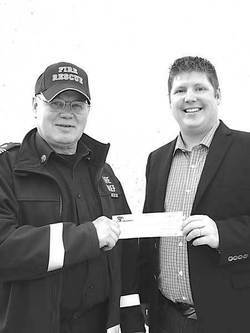 During the May 28, 2013 Thorsby Village Council meeting, Ravenwood Energy representative Devin George presented a $5,000 cheque to the Thorsby Fire Department. Fire Chief Norm Osness accepted the cheque which will help fund the eagerly anticipated new tanker truck. "It's being built now and should be here mid-September," said Chief Osness. "This will go towards the down payment." Ravenwood Energy is a local oil and gas producer with fields stretching "from Devon to New Humble School and almost all of Leduc County," said George, who is also a Thorsby Firefighter. As a generous and responsible corporate citizen, Ravenwood Energy donated $5,000 in 2012 to the fire department for the purchase of the side-by-side ATV. The ATV was put to the test during the recent 9-hour fire northwest of Thorsby, near Strawberry. Osness beamed as he added, "It works great! It came in handy to have!"